X, 256 S., 96 s/w Illustr., 8 s/w Tab. Plants play a key role in purifying the biosphere of the toxic effects of industrial activity. 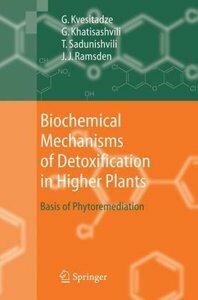 This book shows how systematic application of the results of investigations into the metabolism of xenobiotics (foreign, often toxic substances) in plants could make a vastly increased contribution to planetary well-being. Deep physiological knowledge gained from an accumulation of experimental data enables the great differences between the detoxifying abilities of different plants for compounds of different chemical nature to be optimally exploited. Hence planting could be far more systematically adapted to actual environmental needs than is actually the case at present. The book could form the basis of specialist courses in universities and polytechnics devoted to environmental management, and advanced courses in plant physiology and biochemistry, for botany and integrative biology students. Fundamental plant physiology and biochemistry from the molecular level to whole plants and ecosystems are interwoven in a powerful and natural way, making this a unique contribution to the field.